Diseases mediated by antibodies of the IgG4 isotype, such as myasthenia gravis with anti–muscle-specific tyrosine kinase (MusK) antibodies, pemphigus vulgaris, and anti–M-type phospholipase A2 receptor (PLA2R) idiopathic membranous nephropathy, respond well to B cell–depleting therapies. This response appears even in patients resistant to immunosuppressant drugs and is frequently associated with a profound and sustained depletion of autoantibodies.10,–,12 Considering this, our study aimed to evaluate the response to rituximab in the subset of patients with treatment-resistant CIDP with IgG4 anti-CNTN1 or anti-NF155 antibodies and to determine whether clinical response is associated with a change in autoantibody titer. We included all patients seen in our clinics and those from other Spanish centers meeting the European Federation of Neurological Societies/Peripheral Nerve Society task force diagnostic criteria13 for CIDP who harbored antibodies against either CNTN1 or NF155 and were resistant to IVIg and corticosteroids. Rituximab was offered to these patients as an off-label treatment following our institution's protocol for compassionate use of off-label drugs. Patients received 375 mg/m2 once weekly for 4 weeks followed by 1 dose per month for 2 additional doses. Additional rituximab cycles were administered 1 year after treatment in patients not achieving full recovery. Clinical appointments and blood sampling were scheduled every 3 months during the first year and every 6 months thereafter. Overall Neuropathy Limitations Scale (ONLS)14 and Rasch-built Overall Disability Scale (R-ODS)15 scores were collected prospectively. Patients that remained significantly disabled (ONLS ≥5) despite treatment with IVIg and corticosteroids were classified as treatment resistant. Data were recorded in a coded database. Informed consent for study participation was obtained from all patients under a protocol approved by the Ethics Committee of the Hospital de la Santa Creu i Sant Pau. 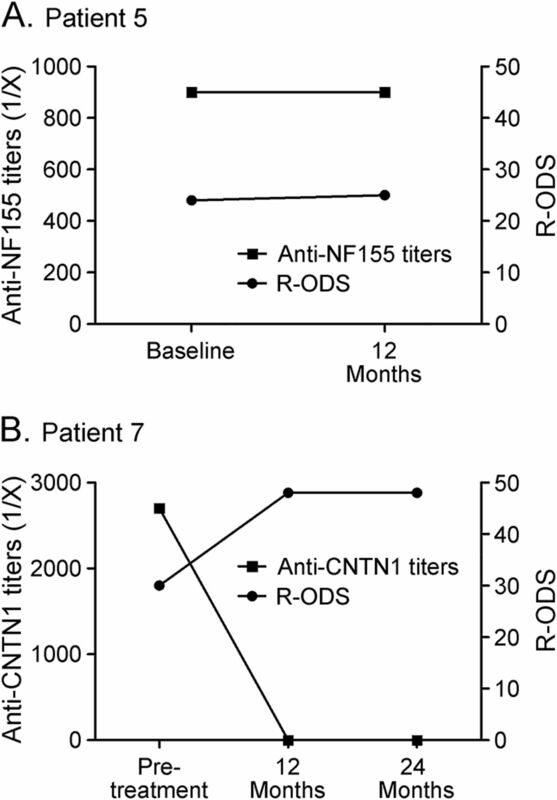 Anti-CNTN1 and anti-NF155 antibody detection and titration. ELISA was used for autoantibody isotype identification and titration, as previously described.3,8 A sample was considered positive when the optical density was higher than that of the average for healthy donors (n = 8) plus 4 SDs. All samples were tested simultaneously. To control for nonspecific IgG titer variation, all samples were also tested with VaccZyme ELISA (Binding Site, Barcelona, Spain) for anti–tetanic toxoid antibodies, following the manufacturer instructions. Anti-tetanic antibody levels are presented in IU per mL. The primary objectives of our study were to describe the response to rituximab in patients with treatment-resistant CIDP with antibodies against paranodal proteins and to correlate the response with autoantibody titers. This study provides Class IV evidence that rituximab is effective for patients with treatment-resistant CIDP with IgG4 anti-CNTN1 or anti-NF155 antibodies. We identified 9 patients harboring antibodies against CNTN1 or NF155 meeting inclusion criteria. Four patients were from our clinics (6.5% of all patients with CIDP) and 5 (of 32, 15.6%) were from different Spanish centers in which anti-CNTN1 or NF155 antibodies were suspected because the patients were either IVIg resistant or their clinical features matched patients that were previously described with these antibodies. Of the 9 patients, 2 died (both anti-CNTN1+, patients 8 and 9), 1 had a complete response to corticosteroids (anti-CNTN1+, patient 7), and 6 were treatment resistant. One of these patients (patient 6, anti-NF155+) was excluded because she had previously received rituximab for a marginal zone B cell lymphoma. Another patient (patient 5, anti-NF155+) declined rituximab treatment. The 4 remaining patients (2 anti-CNTN1+, patients 1 and 4; 2 anti-NF155+, patients 2 and 3) were included in the study and treated with rituximab. The clinical features of these patients have been previously reported.2,3 Three of the patients improved after rituximab treatment in both R-ODS and ONLS scores. Patients 1 and 2 were both severely disabled and had substantial improvement that persisted at 1 year. Neither had responded to previous therapies except for a transient response to plasma exchange (PEx) that did not last longer than 2 months. Rituximab treatment was scheduled immediately after the last PEx course. Patient 1 improved dramatically after rituximab treatment and was able to be withdrawn from other treatments. He has resumed all previous activities (figure 1A) and has not relapsed to date (16 months after treatment). Patient 2 had substantial improvement with mild residual disability (predominantly distal leg weakness) (figure 1C). Disease duration in these 2 patients was less than 1 year at the initiation of rituximab. Patient 3 improved slightly (figure 1E). This patient had significantly longer disease duration (15 years) than patients 1 and 2 and an EMG showed features consistent with axonal degeneration. This patient did not receive PEx prior to rituximab as he had not responded to a prior PEx course after 3 successful PEx courses at disease onset. Patient 4 was removed from the study because she had a cardioembolic middle cerebral artery infarction soon after the first rituximab dose that resulted in severe disability and institutionalization, precluding follow-up evaluations. Patient 1 improved dramatically after rituximab treatment in both Rasch-built Overall Disability Scale (R-ODS) and Overall Neuropathy Limitations Scale (ONLS) scores, reaching full recovery at 12 months (A). 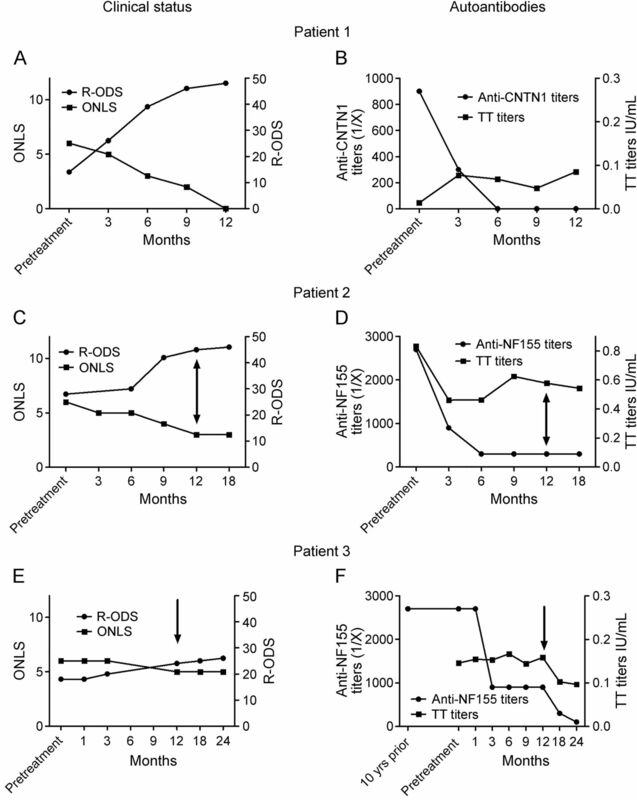 Anti–contactin-1 (CNTN1) antibody titers decreased rapidly and were undetectable as early as 6 months after treatment, whereas anti–tetanic toxoid (TT) antibodies remained stable after treatment (B). Patient 2 had marked improvement after rituximab treatment in both R-ODS and ONLS scores, although mild leg distal weakness persisted (C). Anti–neurofascin-155 (NF155) antibody titers decreased rapidly and remained low 18 months after treatment. Anti-TT antibodies, however, decreased immediately after treatment and stabilized thereafter (D). Patient 3 improved slightly after rituximab treatment in both R-ODS and ONLS scores, although marked disability persisted (E). This patient had a significantly longer disease duration (more than 15 years) and secondary axonal damage. Nevertheless, anti-NF155 antibody titers decreased rapidly after treatment and stabilized at a titer of 1/900. An additional rituximab course further decreased anti-NF155 antibody titers. Anti-TT antibodies remained stable after treatment (F). Arrows represent additional rituximab courses. Anti-CNTN1 and anti-NF155 antibodies were predominantly of the IgG4 isotype in all 4 patients, as previously described.3,8 Anti-CNTN1 and anti-NF155 IgG4 antibody titers decreased significantly in all patients after rituximab treatment. IgG4 autoantibody titers at 6 months were significantly lower or undetectable by ELISA compared with baseline in the rituximab-treated patients. In contrast, anti–tetanic toxoid autoantibodies remained stable or decreased slightly after rituximab treatment (figure 1, B, D, and F). To investigate whether the decrease in autoantibody titers was related to treatment or to the normal evolution of a monophasic immune response, we performed the following studies. First, we tested anti-NF155 antibodies in patient 3 from a serum sample extracted 10 years before rituximab treatment. Titers were similar to those at inclusion (figure 1F). Unfortunately, pretreatment autoantibody stability could not be tested in patients 1 and 2 (as in patient 3) because the only prerituximab samples available were the ones shown in figure 1. Second, in patient 5, who declined rituximab treatment, both autoantibody titers and clinical status measured by R-ODS remained stable after 1 year of follow-up despite treatment with corticosteroids and methotrexate (figure 2A). Finally, in the patient (patient 7) who met inclusion criteria but did not receive rituximab due to a complete response to corticosteroids, the clinical response was associated with a highly significant reduction of autoantibody titers after 1 year (figure 2B). Despite corticosteroids and methotrexate treatment, patient 5 remained significantly disabled but declined to be treated with rituximab and his clinical status and autoantibody levels remained stable (A). Patient 7 is the only patient from our cohort fully responding to corticosteroids. Clinical scales improved clearly and anti–contactin-1 (CNTN1) antibodies disappeared (B). NF155 = neurofascin-155; R-ODS = Rasch-built Overall Disability Scale. Our study reinforces the diagnostic and therapeutic importance of identifying patients with CIDP harboring IgG4 anti-CNTN1/NF155. These antibodies are biomarkers of a subpopulation of patients with CIDP who are resistant to IVIg and steroids but who can have marked and even dramatic improvement with rituximab. The high proportion of IVIg-resistant patients with anti-CNTN1 or anti-NF155 antibodies2,3,16 is in contrast to the high IVIg response rates seen in typical CIDP17 and led us to consider alternative treatments. Rituximab is associated with long-lasting and profound responses in other IgG4-mediated diseases, suggesting that it could be effective in patients with IgG4 anti-CNTN1/NF155 who are resistant to IVIg and corticosteroids. In our cohort, rituximab resulted in a dramatic response in 2 patients and a slight improvement in a third. The fact that disease duration was significantly shorter in the patients who had marked responses suggests that early treatment may be important in order to avoid permanent nerve damage. This hypothesis is supported by the fact that the 2 marked responders had also responded to PEx whereas patient 3, after 3 successful PEx cycles, had become PEx resistant. As response might vary depending on disease duration or axonal damage, early detection of these patients may have prognostic implications. Some case reports and small case series describe CIDP improvement with rituximab,18 but there is limited evidence to recommend its systematic use. Despite the small number of patients, our study illustrates how the IgG4 isotype of the antibodies helped in therapy selection based on pathophysiologic homology with other diseases rather than CIDP-specific features. The recent report by Doppler et al.7 briefly describing 1 IgG4 anti-CNTN1+ patient who also responded to rituximab supports our findings. CIDP is a rare disease and patients with IgG4 anti-CNTN1/NF155 CIDP account for less than 10% of all patients with CIDP.2,3,16 Thus the number of patients with CIDP and IgG4 antibodies is very small, which is the main limitation of our study. However, the magnitude and potential relevance of the findings in these few cases suggest that testing for these antibodies can have important therapeutic implications. Clinical and electrophysiologic diagnostic criteria are undoubtedly essential for detecting patients with inflammatory neuropathies so that treatment can be promptly initiated. However, the identification of specific biomarkers should be a research priority in a tissue-specific and heterogeneous disease such as CIDP.20 Infrequent antibodies may define small CIDP subtypes that, in aggregate, represent a relevant proportion of all patients with CIDP. Identifying novel clinical-immunologic associations will refine the diagnosis of CIDP, guide treatment selection, and help monitor response to treatment. I.I. and L.Q. conceived, designed, and performed the experiments and wrote, edited, and revised the manuscript. L.Q., R.R.-G., E.G., and I.I. analyzed the data. All other authors provided characterized specimens. This study was funded by the Fondo de Investigaciones Sanitarias—Instituto de Salud Carlos III (13/937) to I.I. and 13/014 to L.Q., the European Research Area Network (ACAMIN project), and the GBS-CIDP Foundation. L.Q. is supported by the JR 13/00014 grant of the Fondo de Investigaciones Sanitarias—Instituto de Salud Carlos III. L. Querol received a travel grant from Bayer-Schering and research support from Fondo de Investigaciones Sanitarias, Subprograma Jual Rodes. R. Rojas-García serves on an advisory board for Pfizer. J. Diaz-Manera received speaker honoraria and a travel grant from Genzyme. J. Barcena, J. Pardo, A. Ortega-Moreno, M. Jose Sedano, L. Seró-Ballesteros, A. Carvajal, and N. Oritz report no disclosures. E. Gallardo holds a patent for blood-based assay for dysferlinopathies. I. Illa received a travel grant from Genzyme, is on the editorial board for Neurologia, holds a patent for dysferlin detection in monocytes, has consulted for Grifols, and received research support from Fondo de Investigaciones Sanitarias, ISCIII, Ministry of Health (Spain), Fundacion Gemio. Go to Neurology.org/nn for full disclosure forms. The authors thank Fina Araque, Miquel Navas, Dana Assylbekova, and Roser Alba for technical support. The authors thank the patients and their families for their participation.
. Chronic inflammatory demyelinating polyradiculoneuropathy: from pathology to phenotype. J Neurol Neurosurg Psychiatry Epub 2015 Feb 12. doi: 10.1136/jnnp-2014-309697.
. Antibodies to contactin-1 in chronic inflammatory demyelinating polyneuropathy. Ann Neurol 2013;73:370–380.
. Neurofascin IgG4 antibodies in CIDP associate with disabling tremor and poor response to IVIg. Neurology 2014;82:879–886.
. Nodal proteins are target antigens in Guillain-Barré syndrome. J Peripher Nerv Syst 2012;17:62–71.
. Neurofascin as a target for autoantibodies in peripheral neuropathies. Neurology 2012;79:2241–2248.
. Destruction of paranodal architecture in inflammatory neuropathy with anti-contactin-1 autoantibodies. J Neurol Neurosurg Psychiatry 2015;86:720–728. doi: 10.1136/jnnp-2014-309916.
. Specific contactin N-glycans are implicated in neurofascin binding and autoimmune targeting in peripheral neuropathies. J Biol Chem 2014;289:7907–7918.
. Spatiotemporal ablation of myelinating glia-specific neurofascin (Nfasc NF155) in mice reveals gradual loss of paranodal axoglial junctions and concomitant disorganization of axonal domains. J Neurosci Res 2009;87:1773–1793.
. A single cycle of rituximab for the treatment of severe pemphigus. N Engl J Med 2007;357:545–552.
. Long-lasting treatment effect of rituximab in MuSK myasthenia. Neurology 2012;78:189–193. ; European Federation of Neurological Societies, Peripheral Nerve Society. European Federation of Neurological Societies/Peripheral Nerve Society guideline on management of chronic inflammatory demyelinating polyradiculoneuropathy: report of a joint task force of the European Federation of Neurological Societies and the Peripheral Nerve Society—first revision. Eur J Neurol 2010;17:356–363.
. A modified peripheral neuropathy scale: the Overall Neuropathy Limitations Scale. J Neurol Neurosurg Psychiatry 2006;77:973–976.
. Rasch-built Overall Disability Scale (R-ODS) for immune-mediated peripheral neuropathies. Neurology 2011;76:337–345.
. Contactin 1 IgG4 associates to chronic inflammatory demyelinating polyneuropathy with sensory ataxia. Brain 2015;138:1484–1491. ; ICE Study Group. Intravenous immune globulin (10% caprylate-chromatography purified) for the treatment of chronic inflammatory demyelinating polyradiculoneuropathy (ICE study): a randomised placebo-controlled trial. Lancet Neurol 2008;7:136–144.
. Immunomodulatory treatment other than corticosteroids, immunoglobulin and plasma exchange for chronic inflammatory demyelinating polyradiculoneuropathy. Cochrane Database Syst Rev 2013;6:CD003280.
. Autoantibodies against phospholipase A2 receptor in Korean patients with membranous nephropathy. PLoS One 2013;8:e62151.
. Rapid and reversible responses to IVIG in autoimmune neuromuscular diseases suggest mechanisms of action involving competition with functionally important autoantibodies. J Peripher Nerv Syst 2013;18:275–296.